Chris Stadler, a 2012 graduate of Cornell College from Portland, Ore., has accepted a Fulbright grant through the U.S. Department of State to serve as an English teaching assistant in Germany. He is one of 140 students selected to teach in Germany during the 2012-2013 school year, and he expects to be placed in the southwestern state of Saarland and work with a range of students in grades 5-12. 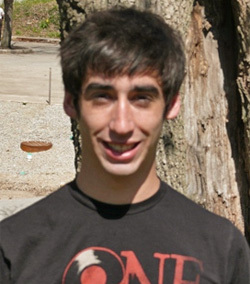 Chris Stadler ’12 has accepted a Fulbright grant to serve as an English teaching assistant in Germany during the 2012-2013 school year. Stadler completed degrees in international relations, politics and German at Cornell. He said that he was able to complete three majors, in part, because of the language proficiency and course credits he gained by attending school in Germany for a year following high school. He returned to Germany for two months in the summer of 2009 on a Cornell Fellowship to work for Youth For Understanding, experiencing the operational side of the program that had provided his own exchange experience. Stadler credits his exchange experience with giving him a high degree of focus from his first year at Cornell, including an early inspiration to pursue a Fulbright or similar program. He noted that the award is not just recognition for his academic work, but the culmination of an intentional process that included a variety of academic and co-curricular experiences. Notably, he worked as a peer consultant in the Writing Resource Center for two years, provided English-language tutoring to adults during his senior year, served as fundraising chair for the Sigma Kappa Psi service fraternity, completed a capstone research project on international human rights with politics professor David Yamanishi, and ran on the cross country and track teams, earning three conference championships and one second place in relay events. “The best thing about Cornell is that there are allies everywhere who want you to succeed,” he said, noting that numerous Cornell staff and faculty helped him identify opportunities and build the skills necessary to be a successful and well-rounded student and grant applicant. He is especially grateful to the Writing Studio staff and Coach Dan Schofer for providing some of his strongest support and most formative learning experiences. “Working under Laura Farmer and Shawn Doyle in the Writing Studio and helping students from across campus with their essays is where I really learned to write, and the experience taught me that writing is a process,” Stadler said. He added that he owes his own “breakthrough” to them—that his Fulbright essays needed many cycles of feedback and revisions in order to refine what he wanted to communicate in a nuanced way. In the long term, Stadler plans to pursue his passion for international conflict resolution through graduate studies in a field such as peace studies or international law. But his more immediate interest, following his Fulbright year, is in building deeper international experiences through further travel and service work, possibly through the Peace Corps. Stadler is the second Cornell student selected for the Fulbright U.S. Student Program this year, sharing the honor with Will Dinneen ’12 who will teach English in Turkey. The program is sponsored by the U.S. Department of State and was established in 1946 to increase mutual understanding between the people of the United States and other countries, through the exchange of persons, knowledge, and skills.